Well, life is a gamble and so far I feel I'm on a losing streak but at the same time a jackpot winner. This year is about turning inward. It is about staying low and keeping my nose to the grindstone, sharpening my skills and developing new ones. It is about exploring the universe within me and plotting a course for a journey that may actually take me somewhere. I love being here in this new place that I call home because it is where I feel at home and where I feel in rhythm with the universe, the earth, the tides. It moves and I move with it. It's that feeling I had in Maine (and lost when I moved). Honestly, I don't want to leave, ever. I feel like I have stride again and I don't want to lose that by heading North but there is the lake and that is another special place where I "move with the earth." (See what I mean about that jackpot?) But the village house, yes the one where the Violet Fern Garden is located, will be on the market this summer and I hope to let it go and that it doesn't break my stride. In this mode of skill development and exploration, I ironically find myself right back where I started and doing it again ... passionate about making a garden and creating art. So again, the garden and art path lies before me and I am going to take it again right here to Cedar Kottage Gardens. I want to be that quirky artist with the funky garden that the townspeople talk about. I think I can/will be. After all, I've done it before — created a garden, created art — and well, this time I think I will do things a bit differently. I'm really taking my time for one with some unfounded level of patience I never knew I had. I have mentors this time around, too. Mentors I've discovered like Marcia Donahue and Keeyla Meadows. I'm reading my way through Keeyla Meadows' book "Making Gardens Works of Art." Kaylee has me looking at colors and shapes differently and thinking in themes — which I love. 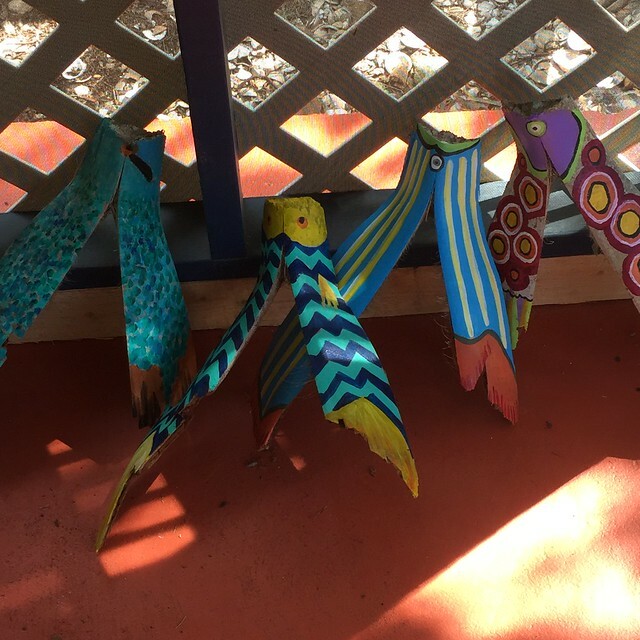 Marcia is really stretching my artistic eye and has me thinking how I can reuse materials in an appealing way. I'm also reading Cal Newport's "So Good They Can't Ignore You." He has given me new perspective on pursuing passions as a career choice. Things are beginning, finally, to fit together in my head. Whereas before I concerned myself with outcomes, I am now concerning myself with processes and development. It's a much better place to be in. Don't get me wrong thinking that I am oh so in tune — my source of income is still incredibly uncertain and so far zilch, but yet, I feel certain that it will come. I just need to keep on keeping on. I need to stay on this path. I have my momentary break downs, as I think we all do. So there is my deep, philosophical reveal about where I've been on my internal journey the past few weeks. 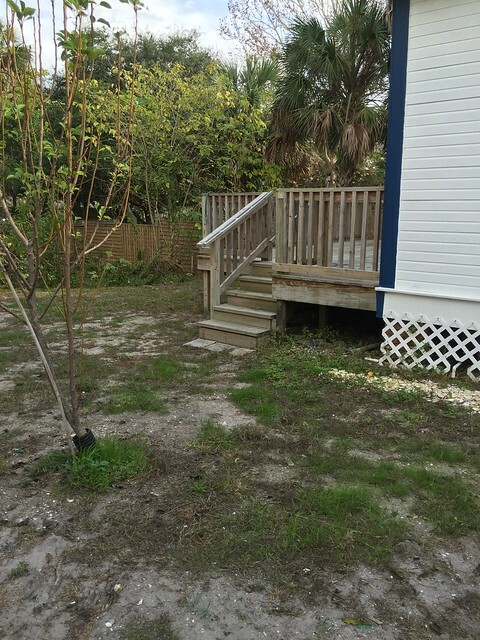 Now let's move on to Cedar Kottage Gardens which is proving to be a challenge. I am having a difficult time learning about native plants and sourcing them here in Florida. 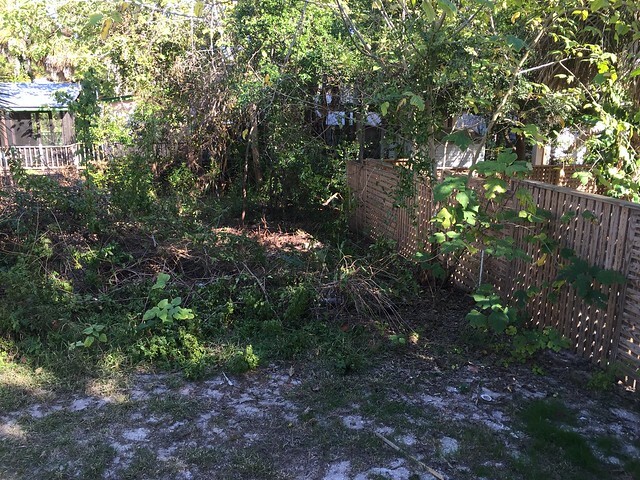 After all, Florida is the land of invasives. I have recently joined the Florida Native Plant Society with the hope of learning more about the plants and where to source them. 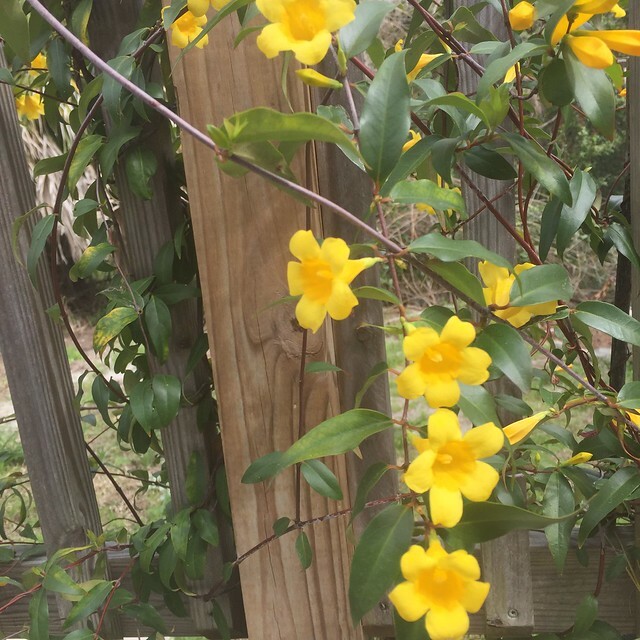 Carolina Jessamine, Gelsemium sempervirens, grows on the rails of our back deck. It is one of the few native plants I've managed to find. Here it is blooming in February for the first time. You have to love a plant that blooms in February. It's been fun watching the bees fly in and out of its flowers and oh, it also smells divine! There aren't any nearby nurseries or landscaping stores when I am in fervor on a whim but this may actually be a good thing. I bring pavers in a few at a time whenever we (husband and I), find ourselves in Gainesville which is a good hour and half away. I've managed to plant approximately 5-8 native plants and the rest are either "rescues" or my enamor with all things tropical being stuck in the North my entire life up to now. I need to be extraordinarily organized for a trip to Gainesville with materials listed and latin plant names memorized so that I come back to the island with something positive. Yesterday I managed to find a native cultivar Yaupon Holly cvs Schillings dwarf at Lowe's, but much to my dismay I discovered that this cultivar is strictly male so no berries — poopy! However, even though male it will still flower and the flowers are beneficial to pollinators in the spring, so there's that. I also have this bias called "I don't want anything that resembles the North" in my new garden - which includes hostas, day lilies, Maple trees and heck yes, even echinacea. Rustic branch structures are out - driftwood structures are in. Tree trunk pedestals are out but palm tree trunks are a-okay. There aren't many stones in FL, but limestone, brick and pavers are permitted and there are shells — many, many oyster and clam shells. Whereas I have decoy fish swimming in my garden up North, I have Palm bark fish swimming here in Cedar Kottage Gardens. Palm bark fish that will swim in a school along our fence. Apparently many artists make these guys into reindeer but reindeer are much to "Northern" for me. Palm tree trunks and an arrangement of pots just in front of the newly screened-in porch in my new love of bright colors. 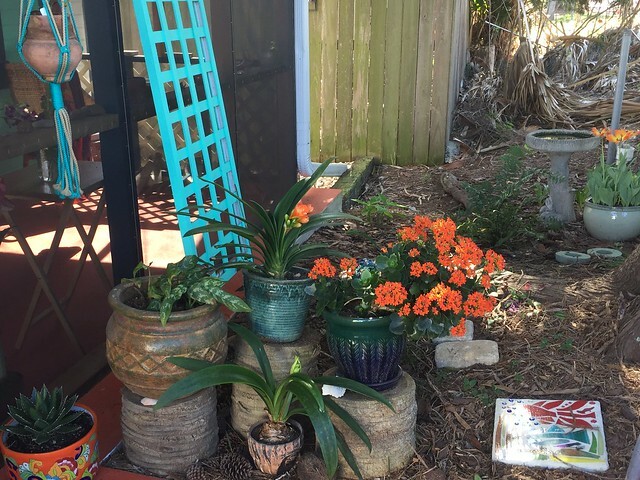 Sadly, none of these potted plants are native but the orange of that Kalanchoe and the just opened Clivia make them winners. 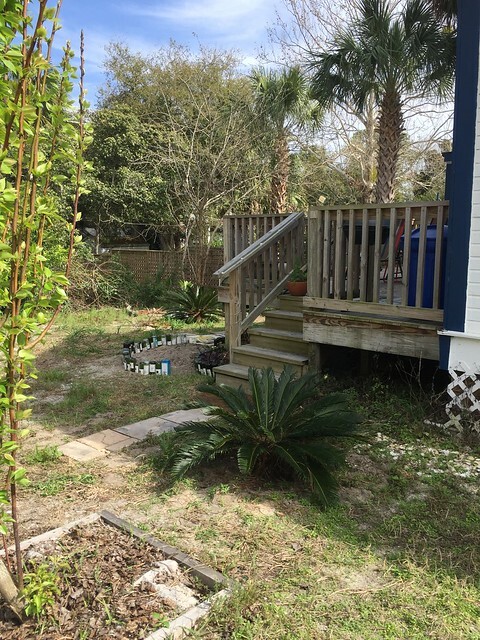 A native Passion Vine, Incense, is planted beneath the trellis and will host, hopefully, Zebra Longwing Butterflies — Florida's state butterfly. A Nepenthes, a carnivorous plant, is planted in the hanging pot and suffered from our cold spell but is making a comeback. It is still very young. Cedar Key recently stopped recycling glass so I am putting all that "glass" to use. Up North I painstakingly scraped all the labels off the wine bottles in my wine bottle border but here the bottles are my edging and the labels stay on. They will disintegrate over time, anyway. (See what I mean about my newfound patience level?) ​Originally I did this out of desperation for fear of the lawn mowing guy mowing down anything I planted over the summer but now, well, I am recycling! The back corner of the "yard" when we moved in. The back corner of the lawn now. The small tree, upper mid-left, I grew from seed. It is not native but a Loquat, Eriobotrya japonica, that flowers beautifully and is usually covered in Monarchs when I walk around the neighborhood which is what attracted me to it in the first place. The fruit is edible and sweet if you're lucky. Apparently it is a crap shoot when growing from seed. It will grow 10-20 ft high. Native Muhly grasses, both pink and white are also planted in this bed. There is also a native beauty berry cut off in the photo. I am so excited to grow this because those purple berries are stunning and not hardy enough to grow in Z4. The patch of Spiderwort, looks like tall grass, is native and I added a Shrimp plant, Justicia brandegeeana, behind that for its tropical blooms. It is not native and not quite in flower yet. 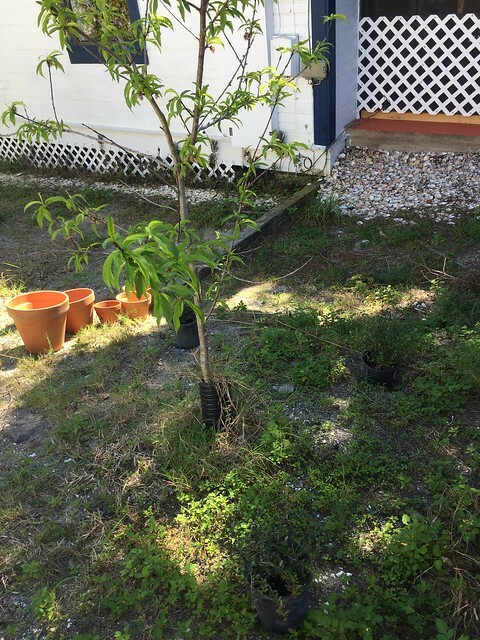 There is also a very young key lime tree because who doesn't want to pick their own key limes? Alas, not native. As you can see the lawn looks horrid in the winter and I plan to pave it over with cement tiles and stone and add a little bistro table with chairs over time. That huge "fountain of foliage" is a rescued Sago Palm that was kicked to the curb and will be part of a future kidney-shaped bed in the center. It is spring here and as such there are some good road finds as people clean up their lawns. 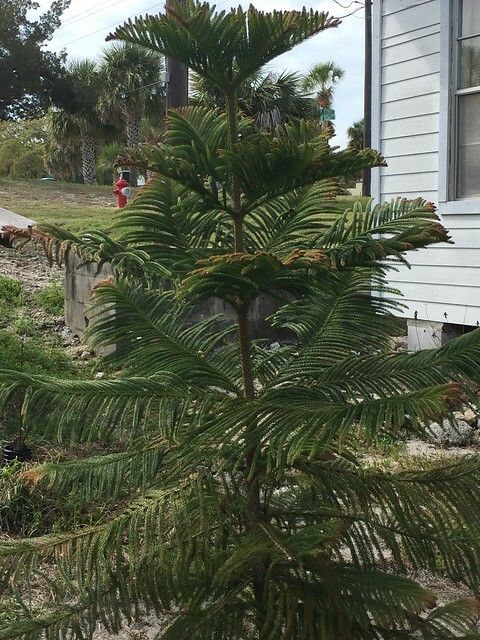 My husband and I have scored on two large Sago Palms and what I believe is a Cook Pine (vs. Norfolk Pine) — only because it survived our cold spell — all kicked to the curb. I'm not sure if they'll make it but we brought all of them home anyway and lovingly placed them back into the ground. Hopefully with a little nurturing they'll happily grow again. Sigh, neither are native but they sure have that tropical flair I love. The view when we moved in. That may be an apricot tree on the left. There were ten fruit trees planted before us including peach, plum, apricot, and apple. The view now. Another rescued Sago Palm and the beginning of a garden path. I have been mulching the fruit trees but need to weed and add more mulch. I simply placed cardboard around them and used some lumber that was left under the deck to build a frame for around the tree and mulched over it. It held up pretty well over the course of a year. I'll continue mulching and weeding out the grass and over time it should hold its own. I plan to plant a white bird of paradise in the new bed where the bottle edge is. It is not native but oh what tropical flair! I can't resist. I want to sit on the deck and be surrounded by tropical foliage. 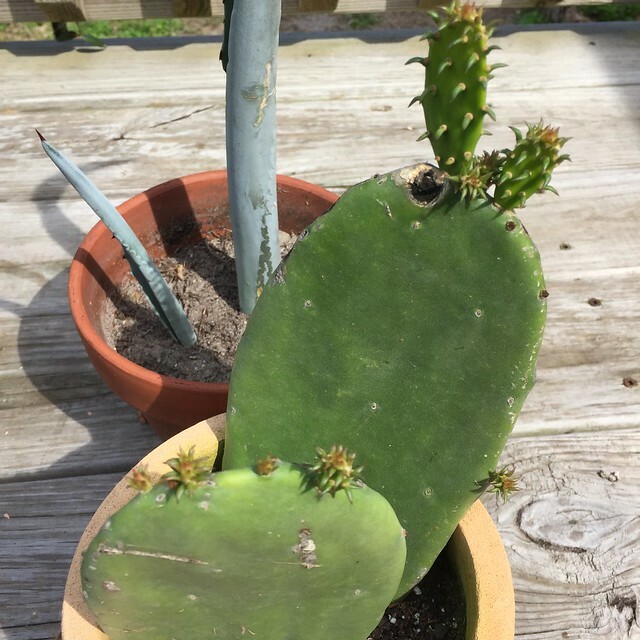 ​These cactus bracts were laying in the road, fallen off the mother plant, in early winter so I scooped them up thinking they were fair game and placed them in a pot — obviously they have rooted with the onset of spring. I'm hoping the same for the century plant (another curb outcast that was too mangled to grab whole so I cut off a few leaves that I also hope will root). I don't know if either of these is native to this area but I do know they grow well here in spite of cold spells. These roadside "rescued" cactus bracts are beginning to grow. I am hoping the same for the blue-grey century spikes behind them. Another roadside rescue, Captain Cook. A cook's pine I believe as a Norfolk Pine wouldn't have faired well in our cold spell this winter. I can't begin to fathom how I am going to learn about the many, many succulents and which may possibly be native? All I know is that succulents are the name of the game. They grow fantastically in pots year round with minimal care. I pick up 2" pots at Lowes or Home Depot and arrange them in my pots. They remind me of corals, the ocean, the sea. I have one started in a Whelk Lightning shell, too — fun! Also at the front entrance of the screened-in porch, various succulents in a collection of pots. Indigenous clam shells fill a little drainage area. This pot border marks the line of the new Lizard Garden. 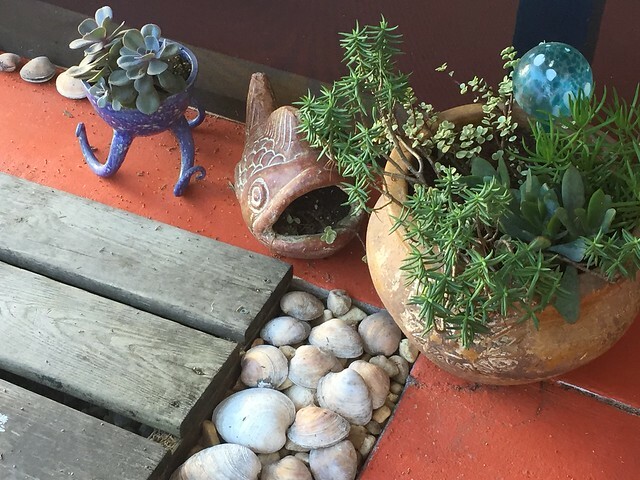 I am going to paint all sorts of colorful lizards on the pots and plant them with succulents. I still need a couple more larger pots (next trip to Gainesville?). 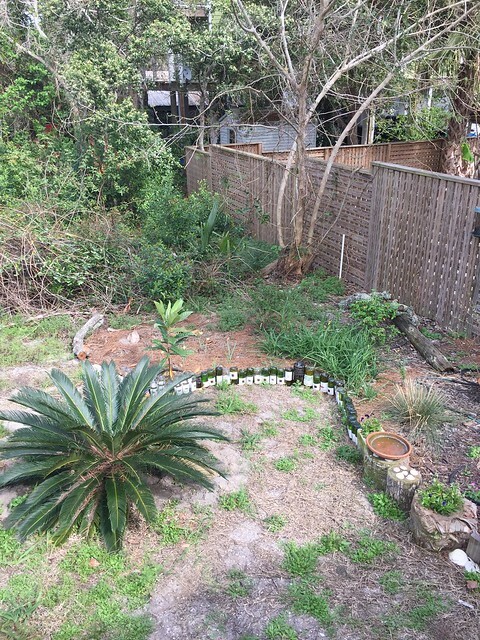 This rectangular area will be mulched by the time we leave for summer and there's a native cabbage palm tree start, Sabal palmetto, on the other side of our house in a not so convenient spot I am going to move here as well so I can view it from the porch. The cactus will be planted here as well. There are many lizards that roam here during the day and they, too, are mostly invasive although I did see a native ground skink one day on our porch! The little lizard guys love to sun themselves and the pots will be great for sunbathing. 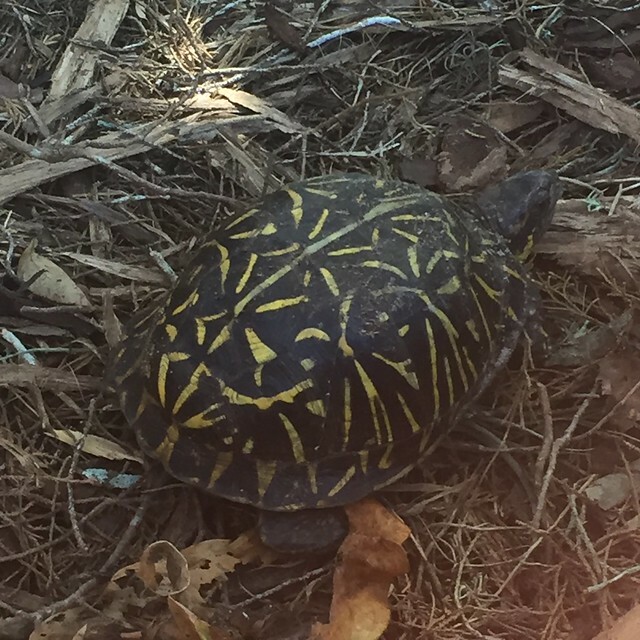 Another native that visits the garden so far, the Florida Box Turtle. Larger ones pass through and I find many babies in the backyard when I'm digging. I want to research them more and see what I can do to create habitat for them. They are really cool! There you have it, the humble beginnings of a "do it again garden." I'll be busy painting, planting, and cooking over here.